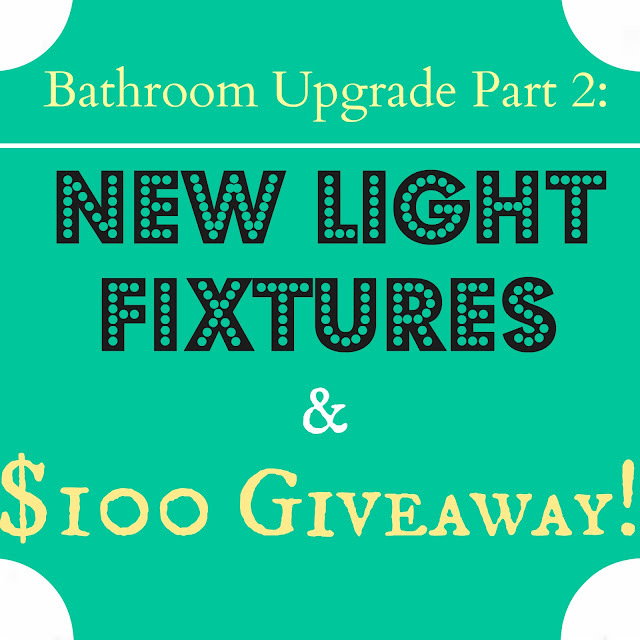 Bathroom Upgrade Part 2: New Light Fixtures and $100 GIVEAWAY!!! Not much of an improvement visually, but just like most renovations, it looks worse before it looks better. Now, let's address the pretty part. I was recently contacted by the great people from Supply.com. They offer thousands of home products and asked if I would be interested in reviewing a couple. I knew I was planning on upgrading my master bathroom and I thought a pair of new vanity lights would be perfect! When I went to search through their online catalog, I could have taken hours! Literally. There are 3211 vanity lights alone to chose from! 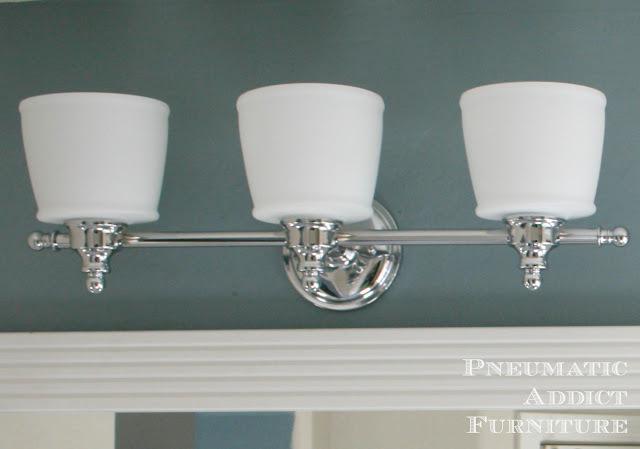 You can find plumbing and lighting fixture for any style of home. Their prices are very reasonable as well. 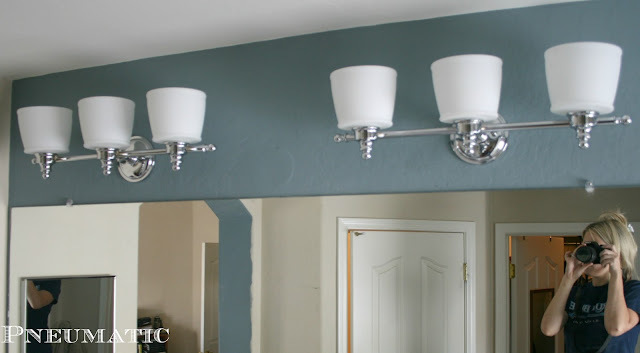 I decided on a pair of Riley Vanity Lights by Kenroy Home in chrome. Installation was a snap! I attached the mounting plates to the outlet boxes, then it was time to wire. *Before you attempt to work with an electrical wiring in your home, first make sure the outlet is switched off. Then, switch off the power to the circuit at the breaker box. If you are unsure about your electrical abilities, please hire a professional electrician to help you. 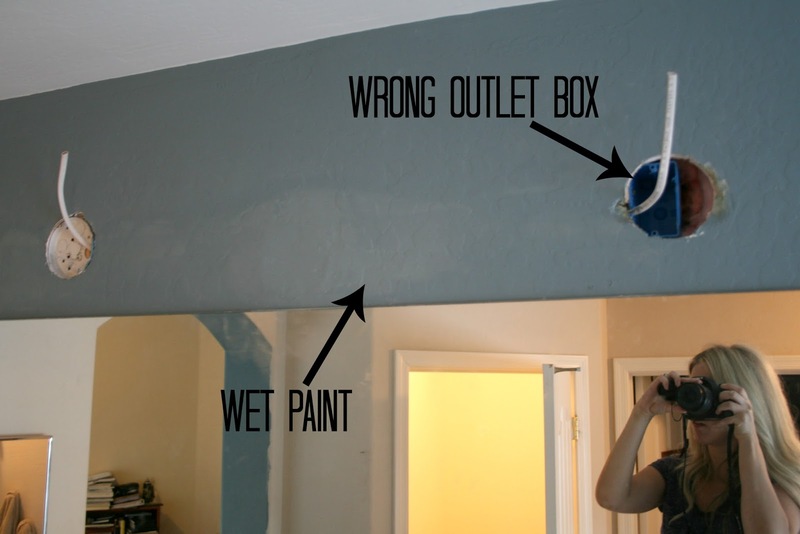 Wiring a light fixture is simple. The video below does a good job of explaining the steps. Once my lights were wired, I attached them to their mounting brackets, added the glass globes, screwed in some CFL light bulbs, and I was done! All I had to do was restore the power. 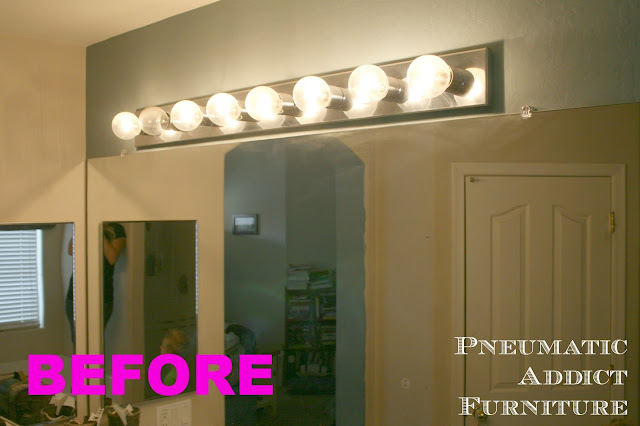 I now have 2 upgraded vanity lights. They are beautiful! I love the way they look. My husband loves how much light they provide (way more than the old fixture). Much more our style! Thanks to the kind people at National Builder Supply, I am giving away a $100 credit towards any online item! What an amazing gift! $100 could buy you quite a lot on their website. Fill out the Rafflecopter below for chances to win. Good luck! Disclaimer: I have been compensated for this post. All opinions are 100% mine and have not been influenced by my sponsor. I'd buy one of the Feiss chandeliers! Looks nice, love your site! I love the light fixtures and paint! What color is the paint you choose. It is the exact color I would love to do in my master bathroom. So pretty. Thank you for sharing with us and for the giveaway. Thanks Lisa! I wish I could tell you the color, but we bought it almost 6 years ago and now the label is too faded to read! I'm sorry. I know its a Behr color, if that's any help. I think if I were to win I would put the money towards one of the Fresca Bathroom Vanities. I love the modern design. I would probably put the money towards outdoor step lighting. I about took a tumble the other day and lighting may have helped. I love the look of your new hardware! I would use the giveaway to update my shower fixtures to a nice rainfall style fixture. Ahhh, i can feel it now. I would use the giveaway to update my shower hardware to a nice rainfall shower head. Ahh, i can feel it now. I need a light for my hallway so would use it toward a pretty one. I would use it toward a hallway light. I'm going to be adding a master bathroom soon, so I'd pick one of their shower faucets! Your bathroom looks beautiful! I would pick a chandelier for either my bath or my dining room! I think I might chose a semi-flush mount light fixture for our front hallway. I would get new cabinet pulls for the kitchen! Seriously? You got rid of your broadway lights? What's wrong with you?! Okay. Kidding. New lights look awesome, and congrats on the giveaway sponsor! I love your lighting pick! 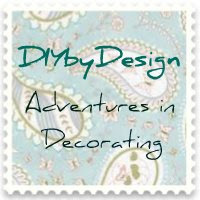 I would get some mini pendant lights for the island in my kitchen reno. Nice upgrade. Doesn't lighting make such a difference? I'd happily use a gift certificate for a new soft-close toilet seat. I need some new hardware for my master bath. I would love a robe hook and knobs for our bathroom cabinets! OMG. I love your blog. How did I not know about you before. Maybe I will win the $100, maybe I won't, but I will be back!